Wow it’s day 11 and Vegan Mofo is really flying by. I don’t have any fresh food to show because it was a killer of a day and I had to survive on take-outs. So I decided to dig up an old favourite of mine…. 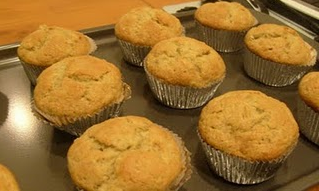 banana muffins. They’re moist and delicious and everyone will love them – and who said baking isn’t easy ? • Mash bananas (overripe ones make the best bread). Add oil/margarine and sugar. Mix well. • Sift the flour, salt, and baking soda together and add to the banana mixture. Mix until the flour is blended (do not beat). Optional: Add a handful of walnuts, oatmeal, raisins, chocolate chips, currants, coconut, or all of the above!